Fast setting:One key wifi configuration to setting your camera via IOS/Andriod smartphone or Window PC. View your camera online Within minutes. With the P2P Server Technology,It's very simple and smoothly. 4x digital zoom through APP remote control,night vision allows you viewing and recording live video even in complete darkness. audio, whether at home or in the office. Home Security Solution: You will get informed anytime by camera's motion detection alert.It will record any alert moment in 24hours working,even in complete darkness. APPs Expansion:You can set up your own surveillance system via our APP,you can keep a watchful eye on your home or business at anytime and from anywhere. HD1080P Video,3.6mm lens,H.264 CMOS,IRCUT inside,P2P Technology,ONIVF supported. Up to 128G TF card suported(not inlcude in pack). Remote Pan/Tilt up to Pan 355 degrees (Horizontal) and Tilt 120 degrees (Vertical). Infrared night vision to 10 metres. Free App for IOS,Android and PC. Two way audio(hear and talk). Motion record/alert according to your setting. Surveillance System by using our freely app fastly. You can save all records in camera TF card(up to 128G) supported or your phone/pc side. AUDIO APPLICATION:Two way audio allows you hear and talk with your friend or family without extra audio equipment. plan for different time periods. APP'S EXPANSION:You will find more function of CosCool camera via our APP,and we will keep updating for more function. Please reset your camera via reseting button when you move it into another wifi area. 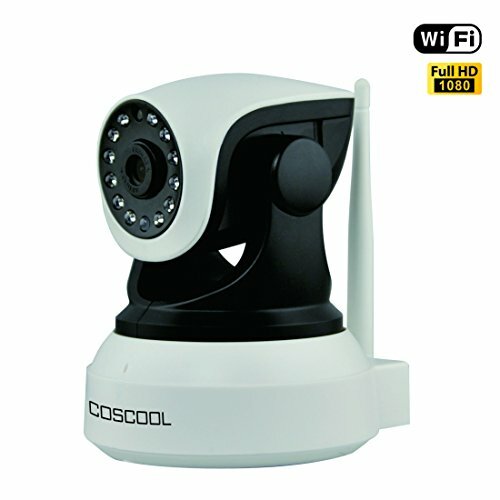 Kindly refer the User Manual before use.CosCool will provide full 1-Year Warranty and Lifetime Support. Pack not include memory card. If you have any questions about this product by CosCool, contact us by completing and submitting the form below. If you are looking for a specif part number, please include it with your message.